CPS officials say they've tried to keep budget cuts out of the classroom, but CTU officials say schools will feel the effects of reduced spending and teacher layoffs. After waiting weeks for a state deal to provide pension relief, CPS officials finally released a budget for next school year that calls for nearly 1,500 layoffs districtwide, delivering a large blow to schools that serve high numbers of special needs students. And there could still be more layoffs in January, district leaders warned, as the $5.7 billion operating budget depends on $480 million in aid from Springfield that still hasn’t materialized. The district says it began issuing pink slips today to 479 teachers, just under half of whom were tenured. Another 866 employees who work inside schools and 146 with citywide assignments also were laid off. CPS officials did not provide a breakdown of layoffs by school or department. But as had been announced earlier this summer, schools that serve large populations of students with special needs or physical disabilities are among the schools seeing the biggest reduction in funding — and positions. Specialty schools for high-needs students lost on average 16.8 percent of their staffing since the start of last school year — significantly higher than the average 1.6-percent staffing reduction that other district-run schools saw. The 128 district-run schools where at least 15 percent of the student body has special needs also experienced higher staffing cuts — on average a loss of 5.8 percent. Reflecting declining enrollment trends, South Side schools continued to lose the most staff. Of the 75 district-run schools that lost at least 10 percent of their staff, just under 60 percent were on the South Side. One-quarter were on the West Side. Similarly, schools with high concentrations of African-American students and students in poverty made up a large number of the the schools hardest hit by staffing loses, again reflecting enrollment trends. Among those same 75 schools, more than half were schools where 95 percent or more of the student population were black or low-income. District officials say laid-off teachers can apply for vacancies due to attrition and retirements — CPS says it will attempt to fill about 1,450 openings before the school year begins. The district is inviting laid-off teachers to a jobs fair on Friday. Some of the teacher layoffs apparently began before today. Last week CPS quietly closed Montefiore Speciality School on the Near West Side, teachers and union officials say. Montefiore serves male students with severe to profound emotional disorders. CPS did not respond to questions Monday about whether it had shuttered Montefiore or any other speciality school. District officials had previously assured that there would be no additional school closures for five years after the historic school closures of 2013. Teachers learned of the closure last Thursday in phone conversation with the school’s assistant principal. Staff had been anxious about the possibility of a closure since last year, when Montefiore got into trouble for allowing VICE Media to film an eight-part series called “Last Chance High” at the school, potentially violating students’ privacy rights. In addition, the number of students at the school has been falling for years, from 52 in the 2009-2010 school year to 26 last fall. CPS made $1.4 million in capital improvements to the building in 2013. Despite the fact teachers were told the school was closing, the budget shows 16 positions at Montefiore this fall. There were twice as many positions last school year. Meanwhile, Vaughn Occupational High School is losing more positions than any other school in the district. Last year, CPS budgeted for 82 employees at the school. That count dropped to 74 by the end of the 2014-2015 school year. It’s now budgeted to have 46.5 positions this fall. 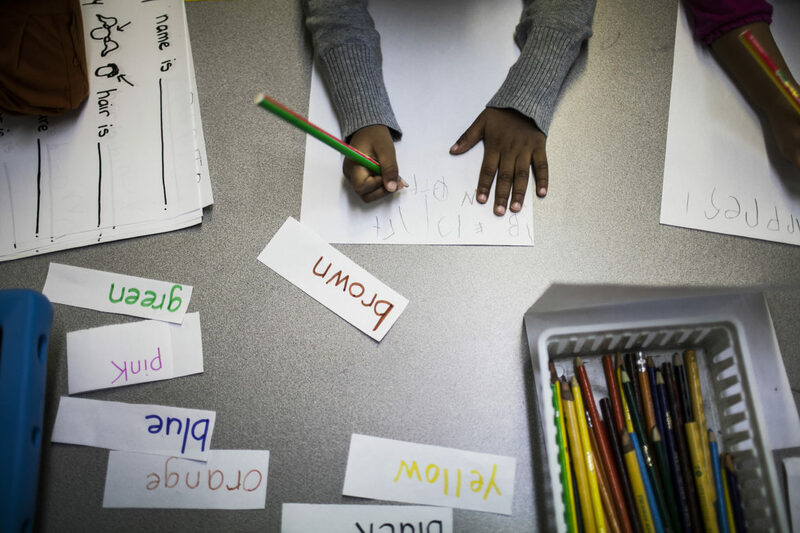 Earlier this summer, CPS officials had announced an overhaul of special education services that was supposed to save $42.3 million. But Rod Estvan of the advocacy group Access Living, says the actual cuts are slightly less severe than he originally expected although he was still analyzing the data on Monday afternoon. He says he’s heard from principals across the district who successfully lobbied CPS for more funding and positions, arguing that they couldn’t serve their students with reduced budgets. The budget released today shows that the Office of Diverse Learner Supports and Services will have 625 fewer positions than it had when school ended in June, nearly all of which are school-based positions. Mayle of the CTU says many of the positions are likely special education classroom assistants. Much of what’s contained in the budget — which will be discussed during three public hearings to be held simultaneously across the city on August 18 — was foreshadowed earlier this summer when CPS announced $200 million in cuts and released school-based budgets to principals. The budget is $68 million smaller than last year’s budget. In addition to relying on $480 million in pension relief from Springfield, it also counts on Chicago raising property taxes to the maximum amount allowable under law, which will bring in about $19 million in extra revenue. The budget also relies on $255 million in debt restructuring — $200 million of which is a “scoop and toss” deal that involves selling new long-term debt to raise money to pay off old debt. “This unsustainable borrowing is necessary to keep cuts away from the classroom because it decreases the amount of state aid we have to dedicate to paying back our bonds,” Chief Financial Officer Ginger Ostro said during the press call early Monday. But the budget does not count on any concessions from teachers regarding the so-called “pension pickup.” Last week CPS backed out of a one-year contract extension it was negotiating with the Chicago Teachers Union, in part because the district wants teachers to pay more of their pension costs. Still, during a press call this morning, CPS CEO Forrest Claypool repeated earlier calls that the teachers pick up more of the costs in order to avoid future cuts in the classroom. The CPS budget book also outlined some significant changes to how Central Office is structured, although CPS did not include an organizational chart in the book, citing the recent change in leadership. Many of the functions of the Talent Office are being broken off and redistributed to other offices. For example, the team that manages principal and teacher evaluations will move into the Accountability Office, while the Employee Engagement unit moves into the Law Department. A total of 120 full-time positions in the Talent Office are moving elsewhere, according to the budget book. The Ready to Learn! PreK admissions process will move from the Office of Early Childhood to the Accountability Office. The Office of College and Career Success, which was already a tiny office, is shrinking from 16 positions to just four. An office will be dedicated to STEM initiatives that’s separate from magnet, gifted and IB programs. Schools with magnet, gifted and IB programs are losing 52 positions from the number they had at the end of the most recent school year. Full-time IB coordinators are being cut back to half-time positions, and international gifted, selective enrollment and magnet schools will see other supports reduced. Also on Monday, CPS announced it would backtrack on controversial plans announced earlier this summer to change the start times at 82 schools. After hearing complaints from parents, students and educators, district officials restored bell times at 34 of the schools and made other changes at eight schools. Still, 40 schools will keep the new start times. The district says the newly adjusted schedules will save CPS about $5 million in transportation costs; previously the district had expected to save about $9 million by changing the start times at 82 schools. Melissa Sanchez is a reporter for The Chicago Reporter. Email her at msanchez@chicagoreporter.com and follow her on Twitter at @msanchezMIA. As Rahm Emanuel courts flashy projects amid a slew of scandals, it seems the mayor is more accountable to big-money donors than to neighborhood constituents. Can Janice Jackson be the anti-Forrest Claypool at Chicago Public Schools? The former educator could bring a different perspective to pressing issues of privatization, special education funding and school closings.